Tommy Wyman arrived on a beautiful, sunny day in Florida at a healthy 7 pounds, 12 ounces. He was Jennifer and Michael’s second child, a perfect little boy. A week after he arrived, Jennifer and her husband took him to the pediatrician for a routine checkup. A nurse checked his heartbeat. She thought she detected a murmur. But, “the nurse practitioner said, ‘it’s not that bad. It’s not like it’s jumping out of his shirt,’” Jennifer recalls. The couple was referred to a cardiologist for a closer look a few weeks later. “‘(His heart is) practically jumping out of his shirt,’” Jennifer says. She can laugh at the irony now, but in that moment, she knew this was serious. The cardiologist explained that Tommy had a hole in his heart. While the holes typically close quickly for some babies, for others, it takes longer. They decided to watch and wait to see how Tommy’s heart progressed, to the tune of one year. At 15 months old, the cardiologist decided it was time to close the hole through surgery since it wasn’t doing it on its own. Tommy’s family prepared for the very scary moment of taking him in for open heart surgery. “It was very emotional and stressful,” says Jennifer of that time nearly 11 years ago. As his doctor performed the surgery, he was shocked to find the hole to be over 75 percent of one wall in Tommy’s heart. This would explain why Tommy had struggled to gain weight in his first year, and why he was always sweaty and weezy. 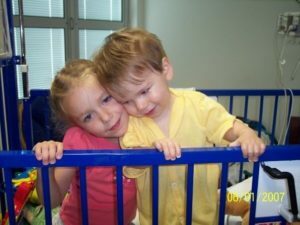 Gratefully, Tommy rebounded well from surgery and Jennifer says he was like a new kid. The toddler gained weight and no longer had his previous symptoms. Going through that season was difficult for the family, but Jennifer says it made a lasting impression on them. 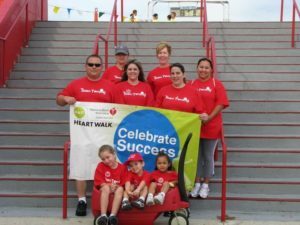 When Tommy was in preschool, Jennifer began organizing fundraising groups for an annual heart walk benefiting the American Heart Association. “I know the American Heart Association has done so much to provide training for the doctors and support” so that’s why we wanted to fund-raise for the organization, says Jennifer. “Without this cardiologist who fixed (Tommy), who knows what would have happened,” adds Jennifer. At the height of their fundraising efforts, Tommy’s team raised thousands of dollars for the American Heart Association. One way she boosted her fundraising efforts was through a friend she met in a Facebook group. After looking through the Take Out Menu, Origami Owl’s jewelry catalog, Jennifer fell in love with the Living Lockets® and customizable jewelry. She decided to jump right in and become a Designer like Abbey. “I figured I could make a few dollars and if a good cause came along, I could donate to it,” she says. That was 2014, and Jennifer says Origami Owl has given her so much more than that. “It’s been a lot of fun and I’ve made so many friends along the way,” shares Jennifer. Today, Tommy is approaching 13 years old and absolutely thriving. He loves being outdoors doing everything from hiking and backpacking to canoeing and fishing. And, while they keep an eye on him with annual heart checkups, the teen is cleared for all sporting activities. 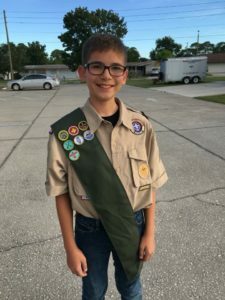 He’s especially involved in Boy Scouts, and is close to becoming a Life Scout, a level just below the organization’s top achievement, Eagle Scout. He’s backpacked parts of the arduous Appalachian Trail.